Altitude sickness—also known as acute mountain sickness (AMS), is a pathological effect of high altitude on humans, caused by acute exposure to low partial pressure of oxygen at high altitude. Although minor symptoms such as breathlessness may occur at altitudes of 1,500 metres (5,000 ft), AMS commonly occurs above 2,400 metres (8,000 ft). It presents as a collection of nonspecific symptoms, acquired at high altitude or in low air pressure, resembling a case of "flu, carbon monoxide poisoning, or a hangover". It is hard to determine who will be affected by altitude sickness, as there are no specific factors that correlate with a susceptibility to altitude sickness. 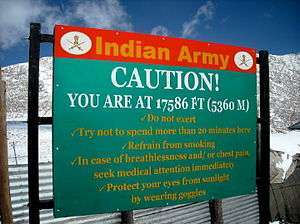 However, most people can ascend to 2,400 metres (8,000 ft) without difficulty. Acute mountain sickness can progress to high altitude pulmonary edema (HAPE) or high altitude cerebral edema (HACE), which are potentially fatal. Right: A woman with a swollen face while trekking at high altitude (Annapurna Base Camp, Nepal; 4130 m). Left: The same woman at normal altitude. People have different susceptibilities to altitude sickness; for some otherwise healthy people, acute altitude sickness can begin to appear at around 2,000 metres (6,600 ft) above sea level, such as at many mountain ski resorts, equivalent to a pressure of 80 kilopascals (0.79 atm). This is the most frequent type of altitude sickness encountered. Symptoms often manifest themselves six to ten hours after ascent and generally subside in one to two days, but they occasionally develop into the more serious conditions. Symptoms include headache, fatigue, stomach illness, dizziness, and sleep disturbance. Exertion aggravates the symptoms. Those individuals with the lowest initial partial pressure of end-tidal pCO2 (the lowest concentration of carbon dioxide at the end of the respiratory cycle, a measure of a higher alveolar ventilation) and corresponding high oxygen saturation levels tend to have a lower incidence of acute mountain sickness than those with high end-tidal pCO2 and low oxygen saturation levels. The most serious symptoms of altitude sickness arise from edema (fluid accumulation in the tissues of the body). At very high altitude, humans can get either high altitude pulmonary edema (HAPE), or high altitude cerebral edema (HACE). The physiological cause of altitude-induced edema is not conclusively established. It is currently believed, however, that HACE is caused by local vasodilation of cerebral blood vessels in response to hypoxia, resulting in greater blood flow and, consequently, greater capillary pressures. On the other hand, HAPE may be due to general vasoconstriction in the pulmonary circulation (normally a response to regional ventilation-perfusion mismatches) which, with constant or increased cardiac output, also leads to increases in capillary pressures. For those suffering HACE, dexamethasone may provide temporary relief from symptoms in order to keep descending under their own power. HAPE can progress rapidly and is often fatal. Symptoms include fatigue, severe dyspnea at rest, and cough that is initially dry but may progress to produce pink, frothy sputum. Descent to lower altitudes alleviates the symptoms of HAPE. HACE is a life-threatening condition that can lead to coma or death. Symptoms include headache, fatigue, visual impairment, bladder dysfunction, bowel dysfunction, loss of coordination, paralysis on one side of the body, and confusion. Descent to lower altitudes may save those afflicted with HACE. 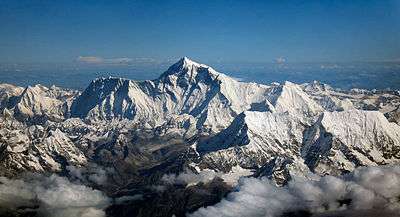 Climbers on Mount Everest often experience altitude sickness. Altitude sickness can first occur at 1,500 metres, with the effects becoming severe at extreme altitudes (greater than 5,500 metres). Only brief trips above 6,000 metres are possible and supplemental oxygen is needed to avert sickness. As altitude increases, the available amount of oxygen to sustain mental and physical alertness decreases with the overall air pressure, though the relative percentage of oxygen in air, at about 21%, remains practically unchanged up to 21,000 metres (70,000 ft). The RMS velocities of diatomic nitrogen and oxygen are very similar and thus no change occurs in the ratio of oxygen to nitrogen until stratospheric heights. The rate of ascent, altitude attained, amount of physical activity at high altitude, as well as individual susceptibility, are contributing factors to the onset and severity of high-altitude illness. Altitude sickness usually occurs following a rapid ascent and can usually be prevented by ascending slowly. In most of these cases, the symptoms are temporary and usually abate as altitude acclimatization occurs. However, in extreme cases, altitude sickness can be fatal. At high altitude, 1,500 to 3,500 metres (4,900 to 11,500 ft), the onset of physiological effects of diminished inspiratory oxygen pressure (PiO2) includes decreased exercise performance and increased ventilation (lower arterial partial pressure of carbon dioxide- PCO2). While arterial oxygen transport may be only slightly impaired the arterial oxygen saturation, SaO2, generally stays above 90%. Altitude sickness is common between 2,400 and 4,000m because of the large number of people who ascend rapidly to these altitudes. At very high altitude, 3,500 to 5,500 metres (11,500 to 18,000 ft), maximum SaO2 falls below 90% as the arterial PO2 falls below 60mmHg. Extreme hypoxemia may occur during exercise, during sleep, and in the presence of high altitude pulmonary edema or other acute lung conditions. Severe altitude illness occurs most commonly in this range. Above 5,500 metres (18,000 ft), marked hypoxemia, hypocapnia, and alkalosis are characteristic of extreme altitudes. Progressive deterioration of physiologic function eventually outstrips acclimatization. As a result, no permanent human habitation occurs above 6,000 metres (20,000 ft). A period of acclimatization is necessary when ascending to extreme altitude; abrupt ascent without supplemental oxygen for other than brief exposures invites severe altitude sickness. Where Vgas is the diffusion rate, A is the area of the lung, T is the thickness of the lung membranes, Dk(P1−P2) is the difference in partial pressure of gases - but most importantly CO2 and O2-where in high altitudes the partial pressure differences for O2 are low and the differences in partial pressures for CO2 are high. Thus CO2 will have a high diffusion out and O2 will have a low diffusion through the alveolar membranes and into the blood. Pre-acclimatization is when the body develops tolerance to low oxygen concentrations before ascending to an altitude. It significantly reduces risk because less time has to be spent at altitude to acclimatize in the traditional way. Additionally, because less time has to be spent on the mountain, less food and supplies have to be taken up. Several commercial systems exist that use altitude tents, so called because they mimic altitude by reducing the percentage of oxygen in the air while keeping air pressure constant to the surroundings. Altitude acclimatization is the process of adjusting to decreasing oxygen levels at higher elevations, in order to avoid altitude sickness. Once above approximately 3,000 metres (10,000 ft) – a pressure of 70 kilopascals (0.69 atm) – most climbers and high-altitude trekkers take the "climb-high, sleep-low" approach. For high-altitude climbers, a typical acclimatization regimen might be to stay a few days at a base camp, climb up to a higher camp (slowly), and then return to base camp. A subsequent climb to the higher camp then includes an overnight stay. This process is then repeated a few times, each time extending the time spent at higher altitudes to let the body adjust to the oxygen level there, a process that involves the production of additional red blood cells. Once the climber has acclimatized to a given altitude, the process is repeated with camps placed at progressively higher elevations. The rule of thumb is to ascend no more than 300 m (1,000 ft) per day to sleep. That is, one can climb from 3,000 m (9,800 ft) (70 kPa or 0.69 atm) to 4,500 m (15,000 ft) (58 kPa or 0.57 atm) in one day, but one should then descend back to 3,300 m (10,800 ft) (67.5 kPa or 0.666 atm) to sleep. This process cannot safely be rushed, and this is why climbers need to spend days (or even weeks at times) acclimatizing before attempting to climb a high peak. Simulated altitude equipment that produces hypoxic (reduced oxygen) air can be used to acclimate to high altitude, reducing the total time required on the mountain itself. Altitude acclimatization is necessary for some people who move rapidly from lower altitudes to intermediate altitudes (e.g., by aircraft and ground transportation over a few hours), such as from sea level to 8,000 feet (2,400 m) as in many Colorado, USA mountain resorts. Stopping at an intermediate altitude overnight can alleviate or eliminate occurrences of AMS. The drug acetazolamide (trade name Diamox) may help some people making a rapid ascent to sleeping altitude above 2,700 metres (9,000 ft), and it may also be effective if started early in the course of AMS. Acetazolamide can be taken before symptoms appear as a preventive measure at a dose of 125 mg twice daily. The Everest Base Camp Medical Centre cautions against its routine use as a substitute for a reasonable ascent schedule, except where rapid ascent is forced by flying into high altitude locations or due to terrain considerations. The Centre suggests a dosage of 125 mg twice daily for prophylaxis, starting from 24 hours before ascending until a few days at the highest altitude or on descending; with 250 mg twice daily recommended for treatment of AMS. The Centers for Disease Control and Prevention (CDC) suggest the same dose for prevention of 125 mg acetazolamide every 12 hours. Acetazolamide, a mild diuretic, works by stimulating the kidneys to secrete more bicarbonate in the urine, thereby acidifying the blood. This change in pH stimulates the respiratory center to increase the depth and frequency of respiration, thus speeding the natural acclimatization process. An undesirable side-effect of acetazolamide is a reduction in aerobic endurance performance. Other minor side effects include a tingle-sensation in hands and feet. Although a sulfonamide, acetazolamide is a non-antibiotic and has not been shown to cause life-threatening allergic cross-reactivity in those with a self-reported sulfa allergy. Dosage of 1000 mg/day will produce a 25% decrease in performance, on top of the reduction due to high-altitude exposure. The CDC advises that Dexamethasone be reserved for treatment of severe AMS and HACE during descents, and notes that Nifedipine may prevent HAPE. A single randomized controlled trial found that sumatriptan may help prevent altitude sickness. Despite their popularity, antioxidant treatments have not been found to be effective medications for prevention of AMS. Interest in phosphodiesterase inhibitors such as sildenafil has been limited by the possibility that these drugs might worsen the headache of mountain sickness. A promising possible preventive for altitude sickness is myo-inositol trispyrophosphate (ITPP), which increases the amount of oxygen released by hemoglobin. Prior to the onset of altitude sickness, ibuprofen is a suggested non-steroidal anti-inflammatory and painkiller that can help alleviate both the headache and nausea associated with AMS. It has not been studied for the prevention of cerebral edema (swelling of the brain) associated with extreme symptoms of AMS. For centuries, indigenous peoples of the Americas such as the Aymaras of the Altiplano, have chewed coca leaves to try to alleviate the symptoms of mild altitude sickness. In Chinese and Tibetan traditional medicine, an extract of the root tissue of Radix rhodiola is often taken in order to prevent the same symptoms, though neither of these therapies has been proven effective in clinical study. In high-altitude conditions, oxygen enrichment can counteract the hypoxia related effects of altitude sickness. A small amount of supplemental oxygen reduces the equivalent altitude in climate-controlled rooms. At 3,400 metres (11,200 ft) (67 kPa or 0.66 atm), raising the oxygen concentration level by 5% via an oxygen concentrator and an existing ventilation system provides an effective altitude of 3,000 m (10,000 ft) (70 kPa or 0.69 atm), which is more tolerable for those unaccustomed to high altitudes. Oxygen from gas bottles or liquid containers can be applied directly via a nasal cannula or mask. Oxygen concentrators based upon pressure swing adsorption (PSA), VSA, or vacuum-pressure swing adsorption (VPSA) can be used to generate the oxygen if electricity is available. Stationary oxygen concentrators typically use PSA technology, which has performance degradations at the lower barometric pressures at high altitudes. One way to compensate for the performance degradation is to utilize a concentrator with more flow capacity. There are also portable oxygen concentrators that can be used on vehicular DC power or on internal batteries, and at least one system commercially available measures and compensates for the altitude effect on its performance up to 4,000 m (13,000 ft). The application of high-purity oxygen from one of these methods increases the partial pressure of oxygen by raising the FiO2 (fraction of inspired oxygen). Increased water intake may also help in acclimatization to replace the fluids lost through heavier breathing in the thin, dry air found at altitude, although consuming excessive quantities ("over-hydration") has no benefits and may cause dangerous hyponatremia. Acetazolamide 250 mg twice daily dosing assists in AMS treatment by quickening altitude acclimatization. A study by the Denali Medical Research Project concluded: "In established cases of acute mountain sickness, treatment with acetazolamide relieves symptoms, improves arterial oxygenation, and prevents further impairment of pulmonary gas exchange." Two studies in 2012 showed that Ibuprofen 600 milligrams three times daily was effective at decreasing the severity and incidence of AMS; it was not clear if HAPE or HACE was affected. ↑ Baillie, Kenneth; Simpson, Alistair. "Altitude Tutorials - Altitude Sickness". Apex (Altitude Physiology Expeditions). Archived from the original on 9 January 2010. Retrieved 26 January 2010. 1 2 Roach, Robert; Stepanek, Jan; Hackett, Peter (2002). "24". Acute Mountain Sickness and High-Altitude Cerebral Edema. In: Medical Aspects of Harsh Environments. 2. Washington, DC: Borden Institute. Archived from the original on 11 January 2009. Retrieved 5 January 2009. 1 2 3 4 A. A. R. Thompson. "Altitude Sickness". Apex. Retrieved 8 May 2007. ↑ A. J. Giannini, H. R. Black, R. L. Goettsche. The Psychiatric, Psychogenic and Somatopsychic Disorders Handbook. New Hyde Park, NY. Medical Examination Publishing Co., 1978. pp. 190, 192. ISBN 0-87488-596-5. ↑ Douglas, Danielle; Robert Schoene (2010). "End-tidal partial pressure of carbon dioxide and acute mountain sickness in the first 24 hours upon ascent to cusco, peru (3326 meters)". Wilderness and Environment Medicine. 21 (2): 109–113. doi:10.1016/j.wem.2010.01.003. 1 2 3 4 Auerbach, Paul (2007). Wilderness Medicine. Fifth ed. Mosby Elsevier. ISBN 0-323-03228-1. ↑ FSF Editorial Staff (May–June 1997). "Wheel-well Stowaways Risk Lethal Levels of Hypoxia and Hypothermia" (PDF). Human Factors and Aviation Medicine. Flight Safety Foundation. 44 (3): 2. Archived (PDF) from the original on 28 November 2010. Retrieved 28 October 2010. The relative amount of oxygen in the air (21 percent) does not vary appreciably at altitudes up to 21,350 meters (70,000 feet). ↑ Hackett, P H; R C Roach (12 July 2001). "High-altitude illness". The New England Journal of Medicine. 345 (2): 107–114. doi:10.1056/NEJM200107123450206. ISSN 0028-4793. PMID 11450659. ↑ Muza, S.R. ; Fulco, C.S. ; Cymerman, A. (2004). "Altitude Acclimatization Guide". U.S. Army Research Inst. of Environmental Medicine Thermal and Mountain Medicine Division Technical Report (USARIEM–TN–04–05). Retrieved 5 March 2009. ↑ World Health Organization (1 January 2007). "Chapter 3: Environmental health risks" (PDF). International travel and health. p. 31. Retrieved 21 November 2009. 1 2 "Prophylaxis". Everest BC Clinic, BaseCampMD.com. Retrieved 21 November 2009. ↑ "Treating AMS". Everest BC Clinic, BaseCampMD.com. Retrieved 21 November 2009. 1 2 Hackett P, Shlim D (2009). "Chapter 2 The Pre-Travel Consultation – Self-Treatable Diseases – Altitude Illness". In Turell D, Brunette G, Kozarsky P, Lefor A. CDC Health Information for International Travel 2010 "The Yellow Book". St. Louis: Mosby. ISBN 0-7020-3481-9. Retrieved 21 November 2009. ↑ Platt, D; Griggs RC (April 2012). "Use of acetazolamide in sulfonamide-allergic patients with neurologic channelopathies". Archives of Neurology. 69 (4): 527–9. doi:10.1001/archneurol.2011.2723. PMID 22158718. ↑ Kelly, TE; Hacket PH (2010). "Acetazolamide and sulfonamide allergy: a not so simple story". High Altitude Medicine & Biology. 11 (4): 319–23. doi:10.1089/ham.2010.1051. PMID 21190500. ↑ Lee, Andrew G; Randy Anderson; Randy H. Kardon; Michael Wall (July 2004). "Presumed "sulfa allergy" in patients with intracranial hypertension treated with acetazolamide or furosemide: cross-reactivity, myth or reality?". American Journal of Ophthalmology. 138 (1): 114–118. doi:10.1016/j.ajo.2004.02.019. Retrieved 5 November 2013. ↑ "Altitude Acclimatization Guide" (PDF). Archived from the original (PDF) on 24 March 2012. ↑ Jafarian S.; Gorouhi F.; Salimi S.; Lotfi J. (2007). "Sumatriptan for prevention of acute mountain sickness: randomized clinical trial". Annals of Neurology. 62 (3): 273–277. doi:10.1002/ana.21162. PMID 17557349. ↑ Baillie JK, Thompson AA, Irving JB, Bates MG, Sutherland AI, Macnee W, Maxwell SR, Webb DJ (May 2009). "Oral antioxidant supplementation does not prevent acute mountain sickness: double blind, randomised placebo-controlled trial". QJM. 102 (5): 341–348. doi:10.1093/qjmed/hcp026. PMID 19273551. ↑ Bates MG, Thompson AA, Baillie JK (March 2007). "Phosphodiesterase type 5 inhibitors in the treatment and prevention of high altitude pulmonary edema". Current Opinion in Investigational Drugs. 8 (3): 226–31. PMID 17408118. ↑ John Sanford (March 2012). "Ibuprofen decreases likelihood of altitude sickness, researchers find". Retrieved 19 September 2012. ↑ West JB (February 1995). "Oxygen enrichment of room air to relieve the hypoxia of high altitude". Respiration physiology. 99 (2): 225–232. doi:10.1016/0034-5687(94)00094-G. PMID 7777705. ↑ Cain SM, Dunn JE (July 1966). "Low doses of acetazolamide to aid accommodation of men to altitude". J Appl Physiol. 21 (4): 1195–200. PMID 5916650. ↑ Grissom CK, Roach RC, Sarnquist FH, Hackett PH (March 1992). "Acetazolamide in the treatment of acute mountain sickness: clinical efficacy and effect on gas exchange". Annals of Internal Medicine. 116 (6): 461–5. doi:10.7326/0003-4819-116-6-461. PMID 1739236. ↑ Lipman, Grant S; Kanaan, Nicholas C; Holck, Peter S; Constance, Benjamin B; Gertsch, Jeffrey H (June 2012). "Ibuprofen prevents altitude illness: a randomized controlled trial for prevention of altitude illness with nonsteroidal anti-inflammatories". Annals of Emergency Medicine. 59 (6): 484–490. doi:10.1016/j.annemergmed.2012.01.019. PMID 22440488. ↑ Gertsch, Jeffrey H; Corbett, B; Holck, Peter S; Mulcahy, A; Watts, M; et al. (2012). "Altitude Sickness in Climbers and Efficacy of NSAIDs Trial (ASCENT): randomized, controlled trial of ibuprofen versus placebo for prevention of altitude illness". Wilderness and Environmental Medicine. 23 (4): 307–315. doi:10.1016/j.wem.2012.08.001. PMID 23098412. Look up altitude sickness in Wiktionary, the free dictionary. Wikivoyage has a travel guide for Altitude sickness.